In celebration of The Avengers being released on Blu Ray this week, let's take a look at one final figure from this line, the updated, more movie-accurate Captain America. This figure is being released exclusively (apparently) in the upcoming Target-exclusive Avengers 8-Pack Gift Set thingy, which is just now starting to show up in some Target stores. For those of use that don't want to plunk down the cash for a bunch of figures we already bought individually, you can also get this guy on ebay from a few Chinese sellers. Interesting side note: One Per Case reader Marc pointed out on our Cosmic Axe Chitauri review that the black space on the back of that figure's card back was actually a sticker covering up an apparent cross-sell for a single carded version of this figure that was to include a rehash of the axe-shield thingy from Ultimate Captain America in the First Avenger line. I'm not sure if that figure was originally intended for a fifth wave of this line, or was intended to be in Wave 4, but there you go. This figure arrived from China in a standard bubble mailer with no packaging. The figure is a retool of the Shield Launcher Captain America from Wave 2 of this line, now with a retooled right leg, ditching the pistol holster that Cap didn't have in the movie, and a new head featuring movie-accurate covered ears and an actual sculpted "A", not just the painted-on version of the original. The head is also less wide, and bears a slightly more passable likeness to Chris Evans. In addition to the retooled parts, this figure also features an updated paint job, that is for the most part, more accurate to the movie. The red on the gloves and boots is brighter, and now features a two-tone color scheme with a darker red to bring out some of the details. The figure's back is now more accurately painted, with the blue center panel running the length of the figure's back, and now the star on the back, which isn't on the movie costume, is left unpainted blue to blend in with the rest of the uniform (it would have been nice if Hasbro had retooled this part to remove the star entirely, but oh well). There is more silver detailing throughout the figure, including the zipper on the front of the legs, the clasps on the boots, and even the "A" on the front of the helmet (which was originally painted white, inaccurate to the movie). Lastly, the blue of the uniform is darker through, and now lacks the contrast of lighter and darker panels on the uniform seen in the original. This is the one thing that I'm not sure about being more movie-accurate. The movie uniform seems to be a deep but bright blue that neither figure seems to have really captured. The first is too light, this one too dark, and neither is vibrant enough. Articulation on this figure is identical to the original, and most of the rest of the line. It lacks any sort of wrist, ankle, waist or torso articulation, which pretty significantly limits its poseability. The only accessory included is Cap's shield, which now also has some additional painted detail around the straps that was not previously present. The pistol, which Cap never had in the movie, has been left out for this release, and there are no giant spring loaded shooty weapons. This figure is a nice upgrade to the original Shield Launcher Cap, especially if movie-accuracy is important to you, but only being available in a box set with 7 other figures you probably already have is a tough pill to swallow. It's difficult for me to really recommend purchasing the figure loose from China, since the quality of what you may receive could vary wildly, so if you decide to go that route, do so at your own risk. I got fairly lucky and didn't have any major paint blenmishes on mine. If you can get your hands on this figure in a manner you consider reasonable, though, and you can look past the hindered articulation, he is a great version of to "Cap" off your Avengers team. Ha ha. I made a funny. Is that advertising? If so, is that allowed? I always thought you weren't supposed to. Speakin' of advertising, anyone notice an issue with the site itself, with ads galore and redirects to ad sites? I am thinking that it's spam/ad bots on your computer. Neither mobile safari or firefox on a pc have ads here. Also I post as trekking95 but on mobile safari (ios6) when I click to type the name it thinks it's a picture with no text box. So nothing can be typed and the box wont close. Lost a good post that way. But it only did it since I upgraded to ios6. No, advertising is not allowed, and no, you aren't supposed to. Hence, spam has been removed. Marc, I checked around but haven't noticed anything. Please let us know if you keep having issues, and what browser you're using. I've noticed that lately when I check in here at work (on my break, honest! ), the site bogs down & takes a while to open; also, my company's virus software/firewall/whatever it's called notifies me that there's a link on the homepage that's possibly malicious. I don't know if it is, but, it's been showing up as such lately. Thanks for letting us know. I tweaked a couple of things. Let me know if you're still seeing issues. Checked it today - worked smooth as silk & no bad site notifications! Awesome, glad to hear it. Thanks for the follow up! 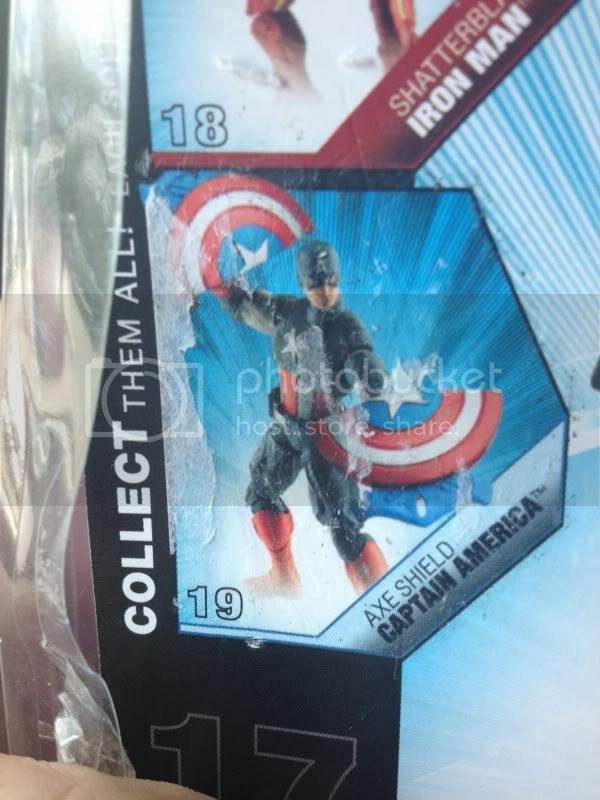 I really want to like the new Captain America figure but I think I'll stick with the wave 1 release. To me the new head sculpt looks nothing like Chris Evans. Wish we could have gotten a new Mark VII with RDJ head but I guess Hasbro is just fine with being sucktastic. how much does the 8 pack cost? Roughly around $50 in the U.S., though I've seen it at a local Canadian comic shop for roughly $70 Canadian. Just bought one of these off a Chinese eBay seller. I'll update later about the quality of the figure. Which seller did you get the Target Cap figure from? The only one I've been able to find doesn't include a shield. Hey, where did that silver Cap come from? Is it a custom or did I miss something? lol. Kinda caught me off guard since I stay up to date on all the figures, and I'm certain I would of known of its existence. Anyways, any help would be great. what head are you using for the "unmaked" cap'?